1/4-20" tapped holes 1" o.c. 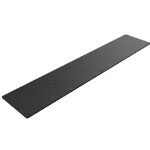 This 12" x 60" x 1/2" thick optical breadboard has 1/4-20 tapped holes on 1" centers. Machine Vision Store offers a large selection of solid aluminum optical breadboards and optical tables. These are top-quality products manufactured in the USA. If this optical breadboard isn't quite what you need, but sure to ask us about rapid-turn customization. Special shapes, hole patterns, materials and finishes are available. Most orders ship the next day, direct from the factory. Due to weight and size, we can either quote freight after receiving your order, or ship using your courier or LTL account. Optical breadboards and optical tables are warranted by the manufacturer for 5 years against delamination, if used according to the instructions. The sole remedy is repair or replacement of the defective product or, at the manufacturer's option, a refund of the purchase price. Defective or incorrectly shipped products are cheerfully replaced. The manufacturer handles all other return requests on a case-by-case basis. There may be a restocking charge. Some items or quantities may not be returnable at all. Items configured with options marked NC/NR cannot be cancelled, nor returned.